Imagine you're in an Indonesian rainforest and a humongous bee, with a wingspan of two and a half inches, flies over your head. 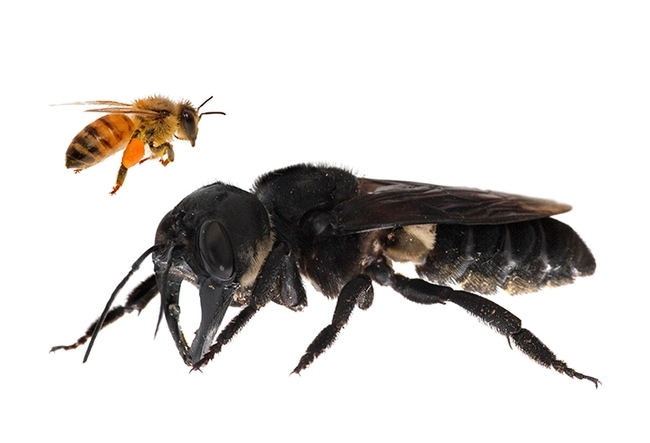 The world's largest bee, known as Wallace's Giant Bee (Megachile pluto), considered extinct since 1981, lives. It's not extinct, after all. You probably read the news. 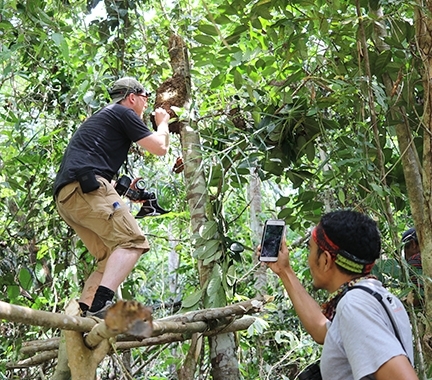 An international team, accompanied by guides, rediscovered the black resin bee in January in the North Moluccas, an island group in Indonesia. The find, announced Feb. 21, continues to draw "oohs" "aahs" and accolades. The four-member team, supported by Global Wildlife Conservation, an Austin, Texas-based organization that runs a Search for Lost Species program, included Honorary Professor Simon Robson of the School of Life and Environmental Sciences at the University of Sydney; Honorary Professor Glen Chilton, of Saint Mary's University, Canada; Clay Bolt, a natural history conservation photographer from Montana who specializes in North American native bees; and entomologist and bee expert Eli Wyman of Princeton University. “It was absolutely breathtaking to see this 'flying bulldog' of an insect that we weren't sure existed anymore,” said Bolt, who is known for his conservation efforts, including his work with the rusty-patched bumble bee. His work (see his website at http://www.claybolt.com) has been featured in National Geographic, Scientific American and many others. “To see how beautiful and big the species is in real life, to hear the sound of its giant wings thrumming as it flew past my head, was just incredible," Bolt said. "My dream is to now use this rediscovery to elevate this bee to a symbol of conservation in this part of Indonesia." 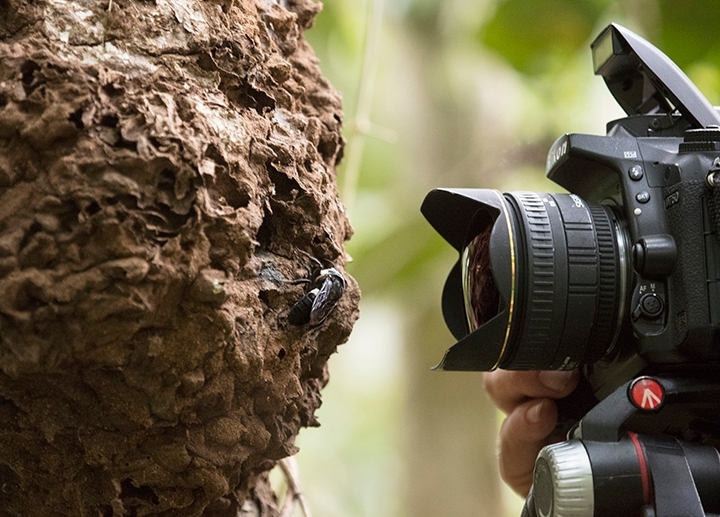 It was the last day of their five-day trip when they found it: a single female Wallace's Giant Bee living in an active termite mound in a tree about 2.5 meters off the ground. The bee, which nests in active arboreal termite mounds, lines her nest with tree resin to protect it from termites. Lynn Kimsey, director of the Bohart Museum of Entomology at the University of California, Davis, and a past president of the International Hymenopterists (she was not involved in the project) surmises that are more in the area. "Finding a female is a good thing," she told us. "Yes, I've had a lot of folks email me and call me about the giant bee," said Kimsey, whose museum houses a global collection of nearly eight million specimens, but no Megachile pluto. "I've actually seen specimens of this beast either at some meetings or the American Museum of Natural History. No surprise that it hasn't been collected since the '80s. Its probably been that long since someone collected in the Moluccas." In his blog, Bolt relates how it all came about. In 2015 he visited Wyman at the American Museum of Natural History “as part of an ambitious project documenting North America's under-appreciated native bee species. Eli was kind enough to show me around. As we looked through drawers of pinned bee specimens from around the world, I drooled over the beautiful array of species. Just before I left, Eli said with a sly grin, ‘want to see a specimens of Megachile pluto?” I couldn't believe my ears and seconds later, I was literally inches away from one of the rarest and most-sought-after insects in the world." “It was more magnificent than I could have imagined, even in death,” Bolt blogged. “Eli shared with me that it had been his dream to try to find the bee in the wild for years and before long the two of us began a lengthy dialogue discussing possibilities, following clues, nearly giving up; ultimately a path to follow in the footsteps of Wallace himself and search for the bee in the Indonesian islands known as the North Moluccas. When we heard that GWC was calling for nominations for their Search for Lost Species program, we convinced them to include Wallace's Giant Bee on their top 25 'most wanted list.' We were one step closer to fulfilling our dream." Fast forward to January 2019. Bolt remembers staring at "termite mounds for 20 minutes at a time" then moving on to the next mound. "It was invigorating but tiring work...As each day went by, we were less and less sure it would happen." "By the last day of searching, we were all dealing with various maladies, including Glen, who had made the difficult decision to return home to Australia after coming down with heat-induced illness," Bolt blogged. "That day we walked down an old orchard road flanked on both sides by mixed lowland forest and fruit trees. Iswan (a guide), ever the eagle eye, spotted a low termite mound, around eight feet from the ground. He later recounted that he almost didn't mention it to us because, like the rest of the team, he was feeling tired and hungry. However, I'll forever be grateful that he did because as we scampered up an embankment to the nest, we immediately noticed that it had a hole in it, like many other nests we'd seen, but this one was a little more perfect. It was very round, and just the size that a giant bee might use. "We had rediscovered Wallace's Giant Bee." They documented it, photographed it, and let it bee. British entomologist Alfred Russel Wallace discovered the giant bee in 1858 when he was exploring the Indonesian island of Bacan. He described the female bee, about the length of a human thumb, as "a large black wasp-like insect, with immense jaws like a stag-beetle." Years went by. It was considered extinct until American entomologist Adam Messer rediscovered it in 1981. And now this international team has rediscovered it...in 2019. Sadly, this is a bee threatened by habitat loss. Between 2001 and 2017, Indonesia lost 15 percent of its forestation, according to Global Forest Watch. "The islands have become home to oil palm plantations that now occupy much of the former native habitat," says Wikipedia. "This has caused the International Union for the Conservation of Nature (IUCN) to label this species as Vulnerable." And sadly, there are greedy entrepreneurs out there anxious to make a buck. Or a lot of bucks. Two specimens sold on eBay in 2018. One sold for $9,100 on March 25, 2018. It was advertised as "very rare--only one!" We need strict conservation efforts--and bans on international trade--to save this iconic bee.